The 1997 vintage is said to be one of those "vintages of the century" by a number of critics. I am not one who has a close and friendly relationship with a vintage chart, preferring to evaluate each wine on its own merits. The vintage was bountiful, producing a large crop. Consumers looking for good values, though, are out of luck. Unless you consider the opportunity to spend $50-$150 a bottle to be "lucky." It certainly has been "good fortune" for the winemakers, finding the market willing to buy these hard-to-get bottlings. This wine was marked down by many for its "barnyardy nose and medicinal, menthol notes." One person described this as "dusty with cherry and plum nuances." Someone else described it as "astringent, lighter bodied and with some earthy notes." Another found "Bourbon-like oak elements." I noted the Brettanomyces (a yeast which contributes the leathery, saddle-like fragrances to the wine) was dominant in this wine. Some people like that character and others find it distracting and unpleasant. Cain's 1996 seemed, if memory serves, to avoid this character. It's back with their 1997. The founders of this label, I recall, were quite snobby about making sure their precious nectar was handled by only the "right people." Now the brand is part of a large corporate entity and they're hoping to have a brilliant reputation for the Quail Ridge wines. They're going to have to come up with better wine than this, I'm afraid. "Jammy, prune-like, over-ripe and yet stalky and stemmy." said our first critic. Someone else likened the aroma of this to "camphor," adding it has a "soda pop or candied note." Another found "a tannic, soft and fuzzy mouthfeel...cassis, over-ripe with chocolate overtones." I found the fragrance to be merely vinous in this line-up, with not much to be enthused about. The flavors, though, were significantly deeper, with good structure and some black fruit notes. An exceedingly rare wine (they sold us but a six pack and yet a non-wine grocery store in the neighborhood has it displayed alongside their mainstream selections! ), Cakebread found one fan who said "This is plummy and complex with lots of sweet oak. There's a hazelnut fragrance to this low-acid red, with ripe cherry fruit and a hot cinnamon note to its nice, full, round finish." A second voice described this as "okay and herbal, with nice fruit and good concentration." Yet a dissenter felt it had "no guts and it's too fruity." One person described the character of this as reminding him of "papaya." I found some ripe berry fruit and nice oak, but not $90-worth of profundity. I gave it a star-and-a-half. 5th Place: ST. SUPRY 1997 Napa "Meritage"
This winery gets much fruit from out in Pope Valley, an area outside of Napa "Valley," though still in the county. I've usually thought the grapes cultivated by this firm are from vines "pushed" a bit for quantity at the expense of quality. Though I ranked this highly (! ), others found it lacking. "Simplistic red wine with a short finish." said the first critic. Another taster found this to have a "lingering finish, mocha notes and come black cherry and cassis." Someone else said this is of "medium intensity, with ripe, red fruit, some spice and a bit of heat to go with the lingering vanillin finish." One person felt there is an "off note" to this wine, though they didn't pinpoint the deficiency. Someone else, though, said it "has volatile acidity and it's dirty, smelling like a winery floor. It's also sharp in the mouth." Another objected to the seemingly high alcohol. I liked the sweet fruit and licorice notes, with some wet earth hints on the nose. There's a nice bit of oak here, too. Sweet fruit on the palate, wrapped in a moderately tannic cloak. One-and-a-half stars. 4th Place: STERLING 1997 "RESERVE"
This winery keeps trumpeting the fact that they're on a "quality" drive. This new release adds a modicum of credence to this notion as the wine IS better than much of the lackluster wine Sterling has been turning out. That being said, I'd ask, "Is this the best you can do?" Well, some tasters found this to be "Caymus styled Cabernet, with lots of oaky and vanillin notes." Another asked "Where's the fruit?" Someone blurted out "No way is this Caymus!!! It's young and sour, with plummy fruit, mushrooms and a minerally note." Another pegged it as "stylish but skinny." The winery's web site notes this is 89% Napa and 11% Mendocino fruit. Is the latter being used to add acidity to an other-wise flat wine? Is this why the wine seems a shade diluted? So many questions! The first word voiced to describe this wine was "Sawdust! It's like a bunch of ground-up trees." The next critic was more descriptive, saying "Minerals and sweet oak, with a chalky note and plummy, toffee-like elements...a complex and complete wine." Someone else said it's got "...good complexity, with unsweetened chocolate and cedary nuances." One person felt this was "average initially, moderately oaked but it improves dramatically in the glass with aeration." My notes have this as having "deep fruit and some alcohol, ripe but not jammy and over-ripe. Nice woodsy, cedar bouquet...Supple entry but a bit of tannin for structure. Deep, ripe fruit on the palate, having blackberry-like fruit and cedary oak. One-and-a-half to two-stars. "This has Brettanomyces and I love it!" said our first critic. Another found the "Brett," saying it has a "band-aid finish." Someone else found it "Intensely complex and what it lacks in polish, it makes up for in complexity." Another person felt this is "as good as it's ever going to be." One taster liked its "silky texture." Someone found it to have "perfumey currants, dense and concentrated with a medicinal note on the finish." I found "herbal, leathery, Brett notes to the fragrance with a touch of cedar and oak. Moderately tannic with some leathery flavors. Big, ripe and a bit aggressive in terms of tannin...this is cellarworthy if you can deal with the Brettanomyces." One star. The commentary on this was, for the most part, positive. I was interested to see someone voicing a negative opinion, finding this to have an off-note of hydrogen sulfide and "burnt coffee." I recall in a previous tasting, someone else finding this same distracting sulfide character. "High acidity and medium-bodied," said one. Another person marveled over its development in the glass saying "It kept coming on and getting better." 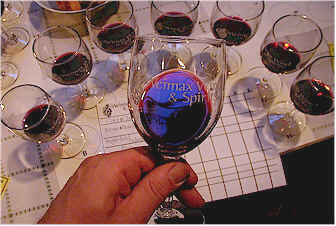 One critic described the Caymus as "Medium ripe, medium intensity, with red and black fruit notes, a hint of pepper and a long, cedary, vanillin finish." Someone else knocked it, saying it's "citric and simple." I found the fruit to be very bright and berryish, with a hint of an herbal quality. Nicely oaked, but not overly so. While previous vintage was more marked by oak, this one seems to have the wood integrated with the fruit. Eight to 15 years of cellaring time. Two stars.